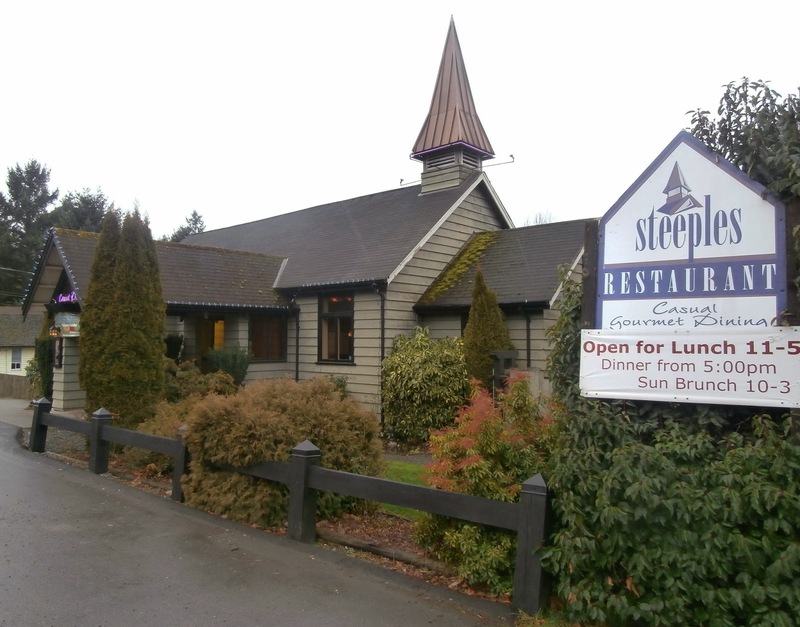 Vancouver Island Travel & Tourism: Steeples Restaurant Shawnigan Lake Village a Must Visit! Steeples Restaurant Shawnigan Lake Village a Must Visit! When you are traveling through Mill Bay try and remember that Shawnigan Lake Village and Steeples restaurant is only a five minute drive off the highway, just watch for the signs. Take the Shawnigan Lake Mill Bay Road of the Island Highway and in 3 miles (Km) you will be there. This restaurant has an enormous menu and the food is incredible. The prices are very reasonable. Today we had a three course lunch consisting of roasted tomato soup with parmesan, a steak sandwich with fries and cold slaw, and Taramisu for desert, all for $9.99. Every single bit of it was delicious. One of our party had a strawberry and goat cheese on field greens salad. It too was delicious. The staff were very friendly and the service was good. It was a great place to meet up with old friends Darrel and Edith. We will be back. Be sure to pass on this secret to your island friends and to guests and tourists who will be travelling the Island. This place should be on all your must visit lists. For more pictures of Steeple Restaurant visit our Facebook Page. Labels: Steeples Restaurant Shawnigan Lake Village a Must Visit! Ithaka Greek Restaraunt - OPA!